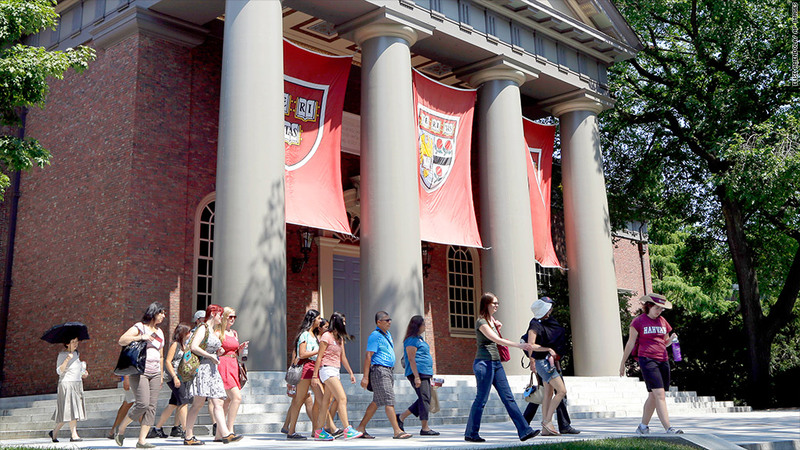 Harvard and other top colleges announced new efforts to court low-income students on Thursday. Yale, Harvard and some of the nation's other most expensive and prestigious colleges are unveiling plans to boost enrollments of low-income students. At a White House summit on college costs Thursday, President Obama announced that 100 colleges and universities plan to either accept more low-income students, provide more assistance to ensure these students graduate, or ramp up their outreach efforts through social media and other channels. Obama said the dream of college is increasingly out of reach for many young adults as tuition and fees continue to climb, drastically limiting their chances of success. "Without college, a child born in the bottom quintile [of income] has only a 5% chance of making it to the top quintile ... the chance of making it to the top nearly quadruples with a college degree," the U.S. Department of Education said in a statement. And often times, that chance is shattered because students don't even realize some colleges are an option. A recent study from the National Bureau of Economic Research found that the majority of low-income, high-achieving students don't end up applying to top-tier colleges, even though they could qualify for large financial aid packages. The new initiatives by Harvard, Yale, Columbia and dozens of other prestigious schools aim to do a better job of making low-income students aware of their financial aid policies and other assistance. Harvard, which already waives tuition for students whose families earn $65,000 or less per year, pledged to spread the word about this program by hiring people to reach out to low-income students via social media. Yale University will provide a free program to low-income students and those who are the first in their family to attend college to help them adjust to college life before freshman year even starts. The program will take place during the summer and will last for five weeks, during which students can take classes and participate in campus events. The university will also begin mailing information about its financial aid policies (including the fact that it covers tuition and fees for families earning less than $65,000), fee waivers and counseling opportunities to about 20,000 additional low-income high school students. The school said it will also partner with Harvard, Princeton and the University of Virginia to conduct outreach sessions in 18 cities where they don't typically receive many applications, some of which are in Arkansas and South Texas. Columbia University, meanwhile, plans to send out more information to low-income students and host more virtual chats and webinars. It is also selecting a group of current students from low-income areas to conduct outreach presentations in their hometowns, and the school said more of its own admissions officers will travel to areas with large populations of low-income and first-generation students. Other schools announcing efforts on this front include Wesleyan University, Harvey Mudd College, Amherst College, Middlebury College and Princeton University. In addition to the colleges, a group of organizations also unveiled new steps to improve college affordability. The College Board announced that it will begin waiving four sets of college application fees for students meeting certain income requirements and who have taken the SAT, for example, and several nonprofit organizations have pledged to help students with college counseling and SAT prep for free. A full list of new efforts is available here.